Okay, Your Maj, point taken: yesterday's somewhat disappointing brooch selection was just clearing the way for something NEW today! 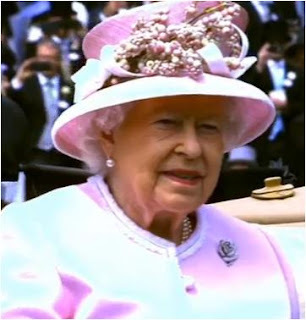 A "Cartier diamond flower clip," per the palace, worn with a cyclamen pink Stewart Parvin coat and an Angela Kelly hat. More in the brooch link below. 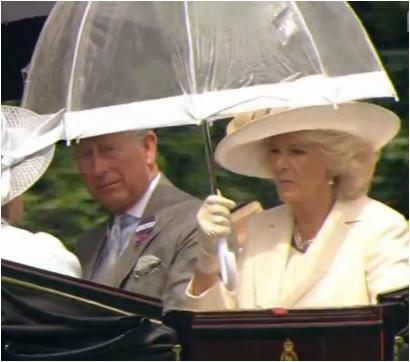 The Duchess of Cornwall clearly had to get her pink outfit out of the way yesterday. With her repeated Christian Dior Couture coat (I think), she stuck to her usual earrings and one of her usual chokers. The Duchess of Cambridge and Crown Princess Mary of Denmark at Day 2 are already up at the other blog, with more fashions from the second day to come over there on Friday!